Nutella swirled chocolate chip banana muffins – Soft, fluffy banana muffins with chocolate chips and Nutella swirls! Mmmmmmm, Nutella. How I love thee. There can’t be a sweet baked good in the world that couldn’t be improved with the addition of Nutella, don’t you think? Bananas and Nutella are simply a match made in heaven. 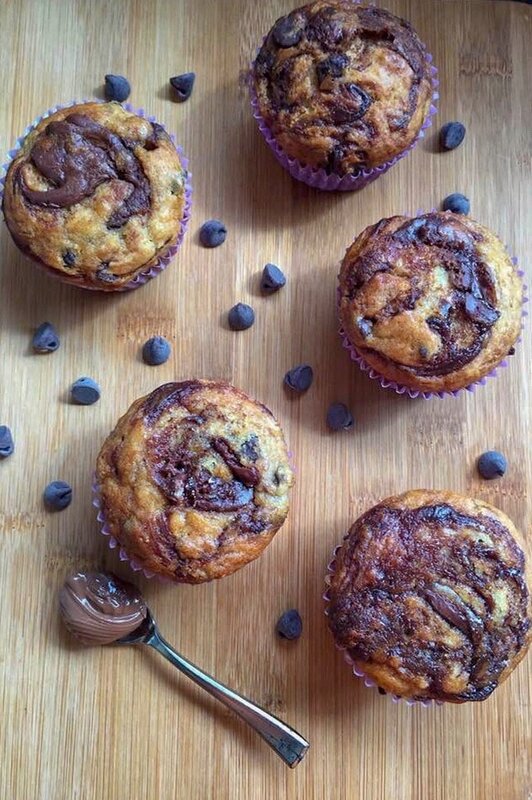 These Nutella swirled chocolate chip banana muffins are a perfect example! My boys are huge banana muffin fans and adding chocolate chips and swirls of Nutella just takes them to another level. If supplies are running low and I have no time to pop to the shops, that’s when this recipe comes in very handy. I always seem to have a few speckled bananas sitting on the kitchen counter waiting for me to use them up. If I know I’m not going to have time to bake with them that week I pop them in the freezer – just slip them out of their skins and place them in a freezer bag for future banana bakes or my banana and peanut butter smoothie. Sometimes I make these muffins in my mini muffin tins and freeze them for another time – pop them in the microwave on the defrost setting for a minute or so and they’ll be perfect. This recipe will give you 24 mini muffins. 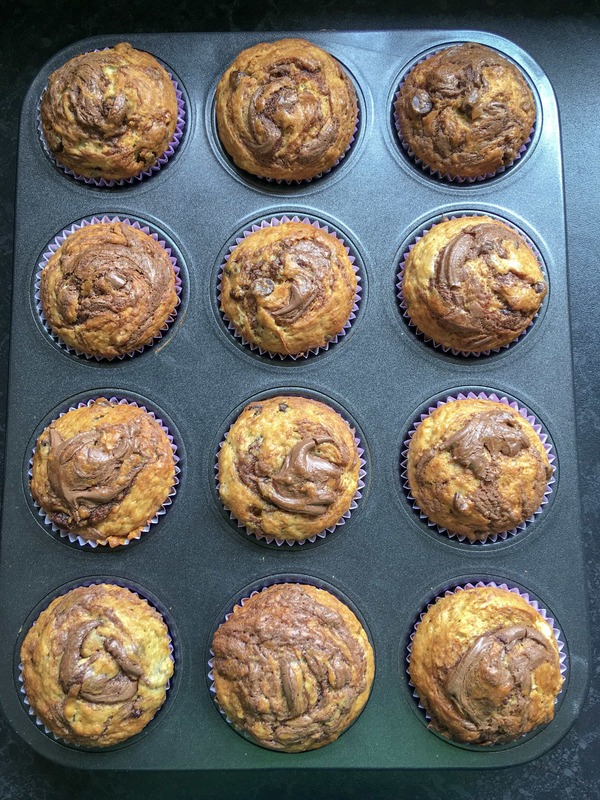 Soft and fluffy banana muffins with chocolate chips and lots of creamy Nutella swirls! Place the flour, baking powder, bicarbonate of sofa and sugar in a mixing bowl and stir to combine. Measure out the oil in a jug, add the vanilla and crack in the eggs. Stir to mix. Pour the oily mixture into the dry ingredients and very lightly stir to mix. Fold in the bananas and the chocolate chips, remembering that a light hand will give you light muffins. Spoon the mixture into the muffin cases, filling them halfway full. Place about a teaspoons worth of Nutella on top of the batter. Top with a little more muffin batter, making sure the Nutella is mostly covered. Place about another teaspoons worth of Nutella on top and using a table knife or skewer, lightly swirl the batter until you have a marbled effect. Bake for 20 minutes or until well risen and the muffins spring back when lighly pressed. Place a wire rack to cool. I highly recommend trying one while they are still slightly warm and the Nutella is still a little melty! Oh what scrummy looking muffins. All my favourite flavours rolled into one muffin, excellent. ? Yum – that last photo should’ve come with a warning – I want to reach into the screen and take it! Yes! 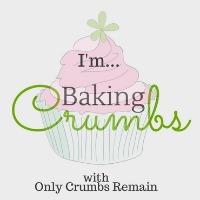 Those muffins sound amazing! Ohhhh Don’t these look delicious, I could just eat one now with my coffee. I think you could be onto something here! Let me know how they turn out if you try it ? These look soooo tasty! I do love ways to use up bananas that are slightly riper. Thanks! I always seem to have over ripe bananas, they don’t last very long ? Good excuse to bake though! Thank you Jo ? Nutella is always a winner with the kids!